Competitive 16 page square booklet printing of full colour books printed and delivered to Ireland at very competitive prices. Fast online full colour booklet printers of booklets at cheap printing prices. To pay online for your competitive full colour booklets could not be simpler as we accept bank transfers, company cheques and all major debit and credit cards, Pay Pal and American Express cards. UK nationwide printing service with online prices. We supply booklets throughout the United Kingdom. All commercial printing prices include delivery. We use next day couriers to dispatch your print work. 16 page square booklet printing at great prices for next day delivery to Ireland. Competitive low-cost full colour book making prices use our 7 to 10 day book printing service. Full colour two sided booklets, 135 gsm gloss silk ~ matt ~ art paper. 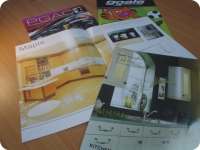 7 to 10 day magazine printing prices are based on supplied artwork. Full colour two sided booklets are printed onto 150 gsm gloss silk ~ matt ~ art paper. Placing an order and commissioning artwork / design services for printed books or commission our designers. Artwork supplied. Artwork checks undertaken. Basic artwork - we will create headings, import text and images into boxes. Premier artwork - Our creative design team will create an effective design and quality artwork for your booklet. Please consult our artwork guidelines, prior to supplying artwork as we only provide one free artwork checks on PDF files that have been correctly supplied. Booklet design instructions. Free booklet artwork checks or low-cost design and artwork. We offer a competitive nationwide booklet printing service to and the rest of the United Kingdom.